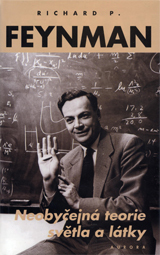 Czech translation of the book by R. P. Feynman: The Strange Theory of Light and Matter was an inspiration for developing computer programs presented here. In the book, author treats the Quantum electrodynamics (QED) view on light in such a clear and comprehensible way that his diagrams provoke to be presented in a form of interactive animation programs. Computer-aided simulation contributes to understanding Nature’s performance of its magic, as in the simulation we can follow the process step by step. Twenty-one interactive programs enable the reader to make “experiments” and analyse single- and multiple-slit interference, reflection including total one, diffraction, refraction and dispersion, followed by operation of lenses, parabolic mirror (antenna) and holography. The last two sections offer discussion on interference and refractive index. The accompanying text is mainly aimed to retrieve basic approach of analyses by the sum-over-paths method. The physical background is treated to such extend only to make the analysis results apprehensible for everyday experience. Key topic ideas are repeated in every section to keep the stand-alone text intelligible.